We can now chalk this up to Ryan Mallett wanting to get cut, and being a willing participant in how swift it was. In a move that could signal the end of any chances Mallett has of ever being a starting quarterback in the league, Aaron Wilson of the Houston Chronicle is reporting that Mallett was constantly late. In fact, Mallett was late twice on the day he missed the team's flight to Miami. The Texans had tolerated the strong-armed former Arkansas standout’s chronic tardiness for months. They endured him being late for a team bus in Richmond, Va., when the team was there for joint practices with Washington with a team official having to go to his hotel room to wake him up. Then, the former Patriots backup quarterback overslept for a training camp practice days after Brian Hoyer was named the starter. Mallett had been fined several times. The final straw for Texans coach Bill O’Brien was when Mallett showed up late for work Saturday at the team facility and was sent home. Later that day, Mallett missed the team flight to South Florida and had to purchase a ticket to fly commercially to South Florida. 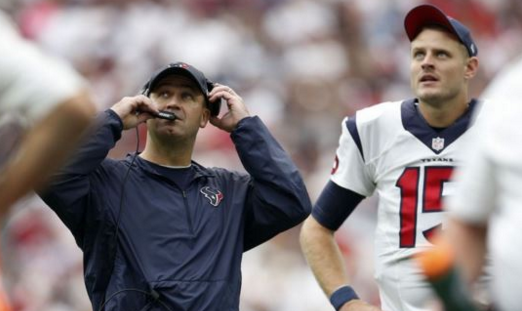 O’Brien initially wanted to fire Mallett before the game, but general manager Rick Smith and he eventually agreed following a dispute it wouldn’t be wise to have only one quarterback on the active roster with punter Shane Lechler as the emergency quarterback. Texans players as a whole say Mallett simply “didn’t get it” when it came to acting like a professional. “Ryan clearly just didn’t get it,” said one Texans player, speaking on condition of anonymity. “How can you miss the flight? That’s ridiculous and disrespectful to just not show up when everyone else is here ready to go. It seems like Mallett has some issues he needs to address, but is it too late?